Excited sightseers crowded round the young calf to take pictures on mobile phones when it wandered into an Indian village. 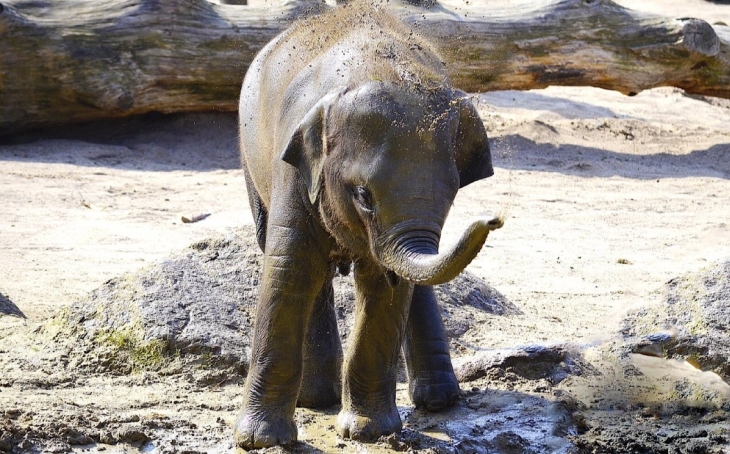 The calf is believed to have been carrying an injury when it followed its mother and another elephant out of the jungle and into the built up area searching for food. 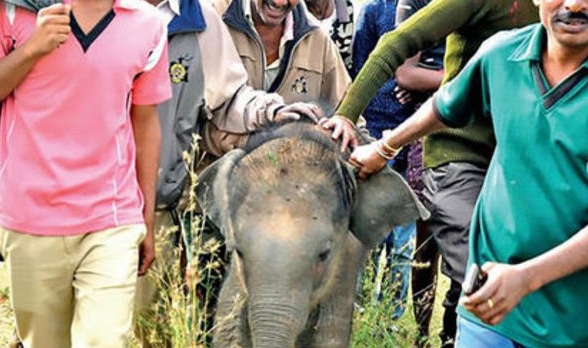 Villagers from Kurubarahandi in the southern part of Karnataka state tried to drive the elephants away with crackers and shouting to protect their crops but in the ruckus the mother and calf were separated. The youngster was too weak to keep up with the adult elephants as they fled and began crying for its mother. A report in the Times of India described how instead of chasing the calf away, people surrounded the animal and began taking photographs. When the mother returned to check the calf, forestry officials had taken it away for treatment to injuries sustained while scrambling down from the forest. A vet treated the calf and it was given four bottles of glucose along with injections and milk but died a few hours later. While most people are aware that poaching poses an imminent threat to elephants, not many realize that human-wildlife conflict is killing pachyderms as well. Responses to "Baby elephant used for ‘selfies’ dies one day after separated from mother"
How could anyone with a heart separate an infant Elephant from its Mother Cow???? Particularly for something as vain & idiotic as a photo. The mother & baby must have been traumatized by such an unnatural forced separation. Humans can be so cruel & stupid !! Moronic villagers should be tied to posts and publicly whipped! and STUPID. THESE PEOPLE ARE NOT NORMAL .GET A LIFE OF INTEREST. people have no limit in their selfishness and greed ... tourists are increasingly stupid. what can we do ? they are not protected there? So why do people this to animals? This poor baby had no chance to live a life free near to it's mommy, aunties,sisters! Mankind pls wake up before it is to late! !